Content Filtering and Sorting – Now Available on your Profile! 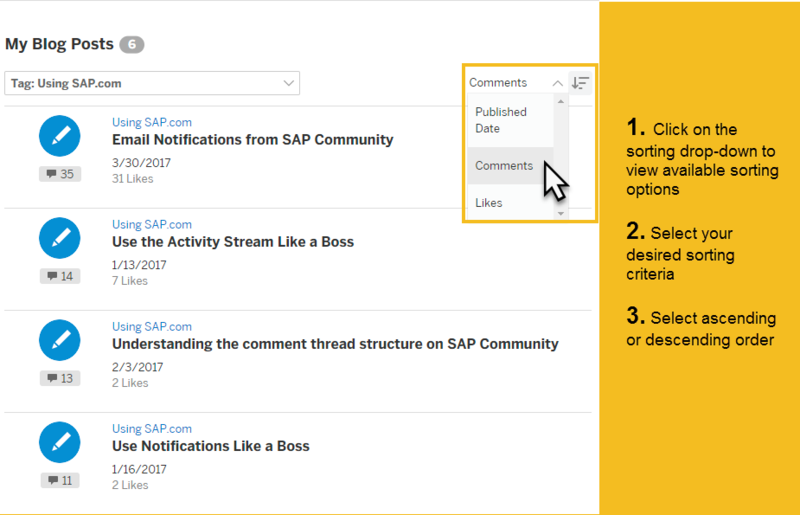 As promised in the blog post, Improvements Coming to Content Lists in Your Profile by Audrey Stevenson, we have seen very useful enhancements added to our profiles. In addition to the @mentions functionality, I have found the addition of primary tags to the content list, the ability to distinguish questions with accepted answers and being able to search and sort followers very helpful. For those of you tracking our communication updates and release notes, you probably know that the former feature has already been delivered. 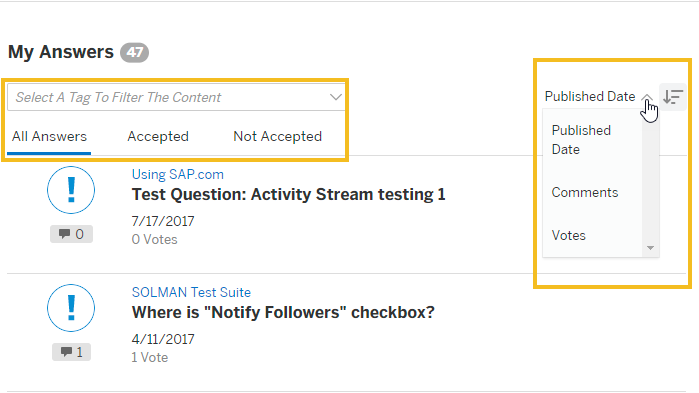 And today, I am very happy to announce that the profile team has rolled out the latter enhancement this week – the ability to filter and sort our content lists! I want to share some quick tips so you can enjoy these new filters and sorting capabilities to the fullest. 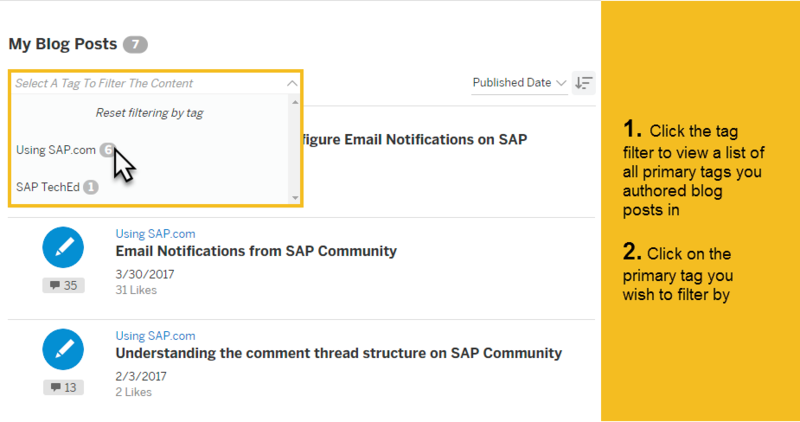 You can now filter all your blog posts, questions, and answers by the primary tag with which they were tagged. 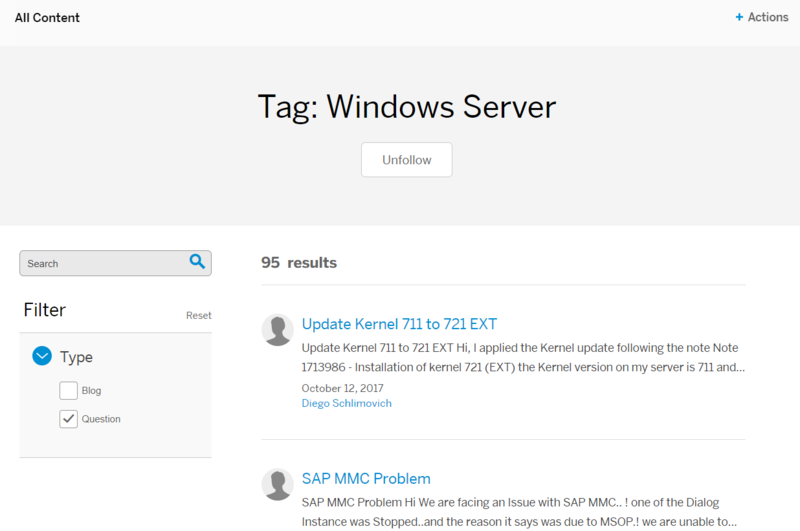 As a result, I can now view all my blog posts authored in Using SAP.com, sorted by the number of comments they received. You can follow the same procedure to sort your blog posts by “Likes” and “Published Date” as well. Please note, the default sorting order is by “Published Date”. You will notice that the list of Questions and Answers on your profile have also received these enhancements. For instance, in addition to filtering all your questions by a primary tag, you can now filter the ones with an accepted answer. You can then sort these results by the indicated categories. I hope you find these new enhancements as useful as I have. Please feel free to reach out to me via comments below or to Audrey Stevenson with any questions about these feature enhancements. Jump right into your profile to start exploring these functionalities yourself! I see your point Kiran and thank you for sharing your thoughts! I have been using the “Not Accepted” answer filter to isolate my answers that may require further following up or acknowledgement from the question OP (as they were not accepted). I see this as an additional nice to have! Without it, I would have to dig through my all answers list to find those. 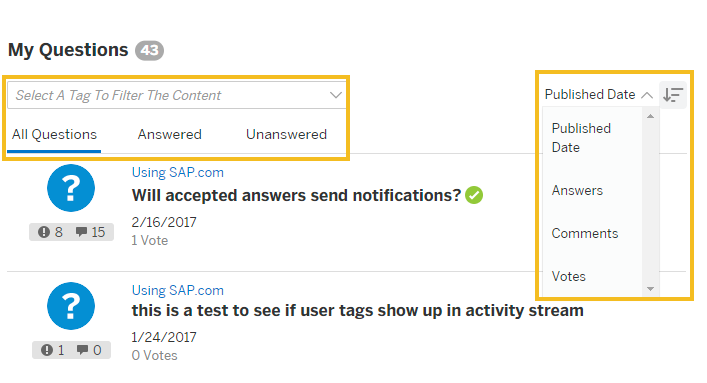 If you really wanted to use the feature to see on which answers you might need to follow up, then we would have received additional indicators on the overall status of the question itself- answered, closed. It could be that somebody else’s answer was accepted or the OP/moderator closed the question, but you would not know that – unless you navigate to the question. Regarding labeling and status there is ongoing conversation with UX and I decided to wait for the final version. We’ll change that once we have the info. Please bear with me. This is a very useful improvement. Thank you for that. Glad you found this helpful Szabolcs! Coffee Corner – sorted by Likes ascending/descending working for other people? I can’t blame it on IE because I happened to be in Chrome when poking around at the new features. Seems to be working fine for me Jeremy and I am testing with Chrome. BTW thank you for bringing this up, I should update the blog post to include that sorting is available for CC discussions as well. It’s not working in IE11 either. Just checked. I first thought, it works, but farther down the scrolling hole there were discussions with more likes, so it’s kind of all over the place. Thanks for reporting Steffi. I’ll update here once I have some more information. Descending: 8, 3, 4, 2, 1, 4, 9, 4, 0, 9, 2, 3. I doubt that this is browser-dependent. I checked the outcome in Firefox, IE11, Google Chrome and Pale Moon and I end up with the same results. Veselina Peykova Jeremy Good Steffi Warnecke the sorting by likes issue has been fixed. Please check again. Thank you, it looks correct now. Blog Posts by Likes up/dn — not working? I would suggest that the DEV/QA teams test/confirm all combinations to ensure full consistency in behavior. I don’t see any problems with your blog post likes sorting. Gives correct results in both directions. Sum of votes and amount of activity are two different criteria, so no bug there. The team does full QA testing and regression tests for every feature and deployment. 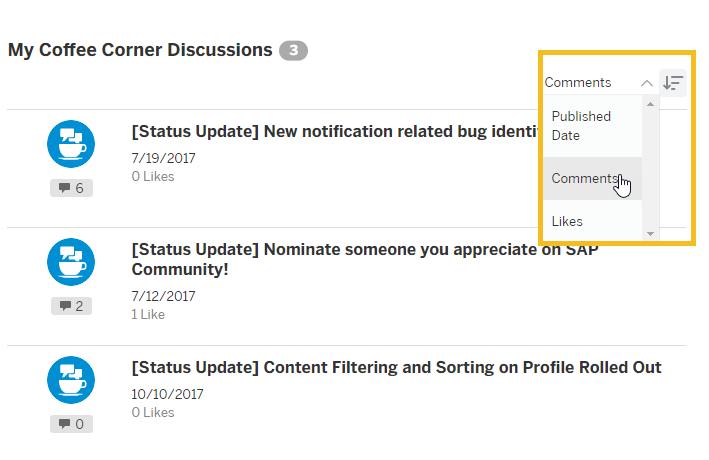 Since only a small portion of the Coffee Corner discussions was affected, the issue with the sorting by likes did not appear during testing. I used the profiles of a few other members who have more blogs than me and I did not notice unusual sort result by likes. Maybe it will be easier for the team to investigate the problem if you can list specific examples? Sorry for the false alarm Gabriella Gogl-Gyorgy – my mistake for mixing the sort with the visual clue. In my haste to quickly check the combinations, I was looking at comments but sorting on likes. All is well, and Veselina, thanks for the extra set of eyes. True, I found the root cause too. Will fix. As for the labelling, please see my comment from above, I’m expecting changes there. If 260+69 = 329, then what is the status of the remaining 32? This is not related to a specific browser. How is it possible to make an error in this simple calculation? Sajid Amir, could you check, please? I am not a web developer. The first thing I would look at would be if all answers ended up with a valid value for status. For what is worth, I do not remember converting comment to answer for some of the missing items, this is not specific to a single submission date, the chances that my answers went into moderation and this somehow broke updating the answer status are low, there were no revisions. Edit: changed the URL for all answers. Aaaa my mistake, error at copy/pasting. "displayName" : "SAP Business Planning and Consolidation, version for SAP NetWeaver"
"displayName" : "EPM Add-In for Excel"
The root cause is that those 32 entries actually do not have the accepted attribute in the db. When you are calling the public API like this, e.g. from browser it will show the default value which is false. So in reality it is not false, it does not exist. We are going to fix that and then the total numbers should be ok.
Another issue found: It takes more then TWO hours for the accepted status for the answer to be updated in the user profile answer list. I am still waiting for update! Is it an overnight batch job? That was accepted 2 days ago. Still shown in my profile as unaccepted! Sajid Amir what do you think about it? P.S. No changes, accepted status in user profile is not updated! We are not doing overnight batch jobs. (yuck) Should be close to real time. There are some updates missing due to incomplete data. Fix for that is already in process. In the meanwhile I triggered an update for your answer, should be correct now. Yes, this particular answer is updated, but other – not! Yes because I only updated that single one, not all. Yet. Looks like new answers with accepted status are now updating correctly and in time! Old ones are still waiting. P.S. Now old ones are also updated! Looks like the issue is solved! Vadim Kalinin , Veselina Peykova , Steffi Warnecke kindly allow us time so we can investigate further. I have reached out to the relevant parties and am awaiting a response now. I’ll update here as soon as I have more information. I think this is a very nice improvement. What I would like to see, however, is a filter for all open questions on a tag – not just my own questions. Sorry, but it’s your user profile and you have here your items! But on a tag page, I have to open every single question in order to see if they have been answered yet. I think for moderators and people trying to keep an eye on the content of specific tags, it would be a huge benefit to have an easy way to filter for answered/ unanswered questions per tag. “But on a tag page, I have to open every single question in order to see if they have been answered yet.” – not clear what do you mean! 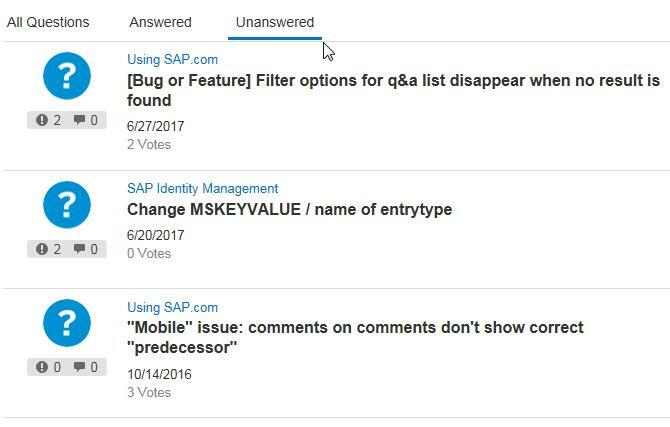 On the tag page you can select filter: Status “Unanswered Questions” and you will get list of questions without accepted answer! Do you have a link to a description/ blog/… how I can get that filter? Or do I have to be a moderator to see this? Wow, okay thank you so much. I didn’t even know a page like that existed… I would have just included the Answered/Unanswered filter directly in the other tag page. Anyways, thanks so much. That makes my life a whole lot easier!